CLUTCH has just announced a string of Spring headline tour dates starting on April 27th in Chattanooga, TN. 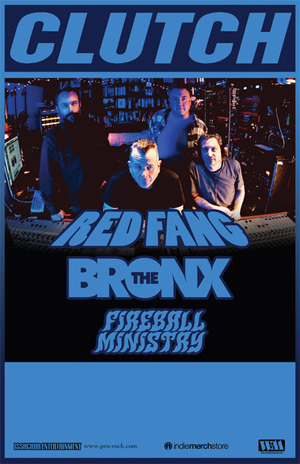 Supporting the tour will be THE BRONX, RED FANG and FIREBALL MINISTRY. Fan club pre-sale tickets will go on sale today, Tuesday, January 30th at 2:00 pm and will be available through Thursday, February 1st at 10:00 pm. Fan club tickets will be available at https://www.mt.cm/clutch Password: fans1. Tickets will go on sale to the general public Friday, February 2nd at 10:00 am at local outlets as well as at pro-rock.com and www.facebook.com/clutchband.